Updated list of standard feature list which includes dual airbags, ABS with EBD, ISOFIX child seat anchors, speed alert, reverse parking sensors, etc. 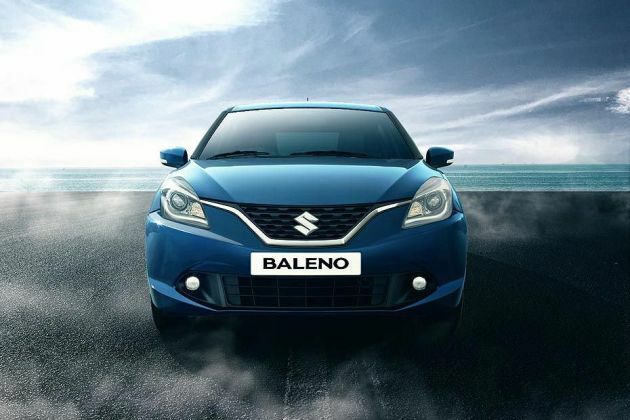 Have a question on Baleno? Baleno is available in 6 different colors - Granite Grey, Fire Red, PREMIUM SILVER, Premium Urban Blue, Ray Blue and Autumn Orange. Watch latest video reviews of Maruti Baleno to know about its interiors, exteriors, performance, mileage and more. Maruti Suzuki launched the Baleno in the year 2015 to counter an old segment which was started by VW Polo and triggered by Hyundai Elite i20. More than three years down the line and the premium hatchback has crossed the 5 lakh mark in the country in just 38 months of launch, the quickest to achieve this feat. Baleno has been rolling out from Maruti’s premium outlet Nexa and has been consistently dominating the segment since then. But with the launch of updated Hyundai Elite i20 and Honda Jazz, it was indispensable to maintain the momentum. So, the carmaker has given a range of updates to Baleno to retain its dominance in the league. The latest series of changes are limited to aesthetics and comfort with the mechanical remains unchanged. The new Baleno sports a fresh face with more aggressive grille and revise bumper. The grille has been given a 3d design while the earlier HID projector headlamps have been replaced by LED projector headlamps with LED DRLs. The car gets new chrome lining beneath the grille along with new fog lamp enclosure enhancing the overall front profile. There are not many changes on the sides except the new dual-toned 16-inch diamond cut alloy wheels making the car look more contemporary. At the rear, Maruti skipped doing any changes to this premium car. The Baleno continues to sport the same bolder design that makes its presence felt from distance. The RS version sports a lot of style elements such as revamped front and rear bumpers, new mesh grille and side skirts. The headlamps are bi-xenon in this version and while the alloys are identical, they are painted in black for differentiation. Dimensionally, the car measures 3,995mm in length, 1,745mm in width, 1540mm in height while the wheelbase stands at 2520mm. The car is available in 6 graceful colour options including Nexa Blue, Metallic Premium Silver, Pearl Phoenix Red, Pearl Arctic White, Metallic Magma Grey and Premier Autumn Orange. Inside, the cabin gets dual-tone black and blue colour scheme. There are now chrome inserts around the air cons and the central console. The seats are covered in black fabric with blue inserts. There infotainment system has also been updated with the new 7-inch SmartPlay Studio infotainment unit replacing the older SmartPlay infotainment. This new infotainment system is seen in the facelifted Wagon R launched recently and now sourced from Harman instead of Bosch. The unit supports Android Auto, Apple CarPlay as well Navigation with live traffic update through SmartPlay Studio app. It also supports voice recognition functionality plus doubles up as the display for rear parking camera. Other comfort features remain intact such as push engine start/stop button, tilt and telescopic steering, electrically adjustable ORVMs, automatic AC, 60:40 rear seat split, height adjustable driver seat and front and rear seat adjustable headrest. In the safety department, the standard feature list has been updated as the car now gets dual front airbags, ABS with EBD, reverse parking sensors, speed alert system, seatbelt reminder, seatbelt pre-tensioner and force limiter and ISOFIX child seat anchorage. Other safety aspects include auto dimming IRVM, automatic headamps, rear wiper and washer, front fog lamps and reverse parking camera. In terms of specifications, the car continues to be powered by the same set of petrol and diesel engine options. The 1.2L petrol engine produces 84PS and 115Nm of torque while the 1.3L diesel engine pumps out 75PS and 190Nm of max torque. Both the engines come mated to 5-speed manual transmission while the petrol engine also gets CVT automatic. Mileage figures also remain the same with the petrol motor delivering 21.4kmpl, the diesel one on the other hand, returns ARAI certified mileage of 27.4kmpl. The Baleno also comes in a powerful version known as RS powered by 1.0L 3-cylinder turbocharged petrol motor from the boosterjet family. The powertrain is good for making 102PS and 150Nm of max torque, paired to 5-speed manual transmission. This makes Baleno the most powerful Maruti car ever launched in the country. The instrument cluster is the same 4.2 inch colour TFT multi information display in the middle. The white fonts with blue circles look cool. The MID shows information such as real-time and average fuel consumption, time, outside temperature and distance to empty counter. The instrument cluster also shows the power and torque being used with clean animated graphics. The steering wheel is familiar and gets tilt and telescopic functionality along with mounted controls for music and telephony. It is also good to hold. Coming to the seating and space, the front seats offers excellent support with new black fabric with blue inserts. Here you will find decent storage space with nice quality of materials. The doors get adequate sized storage pockets for holding 1L of water bottle. The car is quite spacious with 5 adult can occupy the seats comfortably as there is ample headroom and legroom. However, the only con here is the absence of rear ac vents centre armrest which Maruti should have included in the face lifted version. But the good thing is that automatic climate control is now available right from the Delta variant. The boot space is sufficient with 319L of luggage storage which can be further extended by flipping the rear seats in 60:40 ratio. Overall, the carmaker has given decent updates this time around but misses out on some of the prominent features. The headlights also get daytime running LEDs in the top spec model. Further, in terms of distinction, the front bumper has been revised housing a larger air dam while the fog lights now gets new enclosure and are closer to headlights. Turn to the side and the profile looks a bit unusual. The profile remains rounded, especially at the back and not as sharp as Volkswagen Polo and Hyundai i20. But this wouldn’t polarize opinions much. However, what the carmaker did right this time is giving new dual-toned 16-inch diamond cut alloy wheels replacing the old plain jane wheel caps. As the engine options remain unchanged, so is the fuel efficiency figure. Where the petrol motor delivers 21.4kmpl with both the manual and automatic transmission, the diesel run Baleno is able to deliver ARAI certified mileage of 27.4kmpl. Another plus point is the steering wheel which behaves light at low speeds and quite weighted at higher speeds. And this is superior to that of Honda Jazz and Elite i20 as there steering response is less weighted at higher speeds. The Baleno underpins all-new platform which is stronger by 10 percent and at the same time lighter that gives it a fundamental advantage in terms of performance. But it isn’t as tight and fun-to-drive as sibling Swift, yet the dynamics are well sorted without any nasty surprises. Throw the car at corners and it will manage the intended line. So the ride and handling is spot on for the urban driving setup and good for occasional highway trips. The carmaker retains the engine options with the same 1.2L K12 petrol motor and 1.3L Fiat sourced diesel mill on offer. The petro one has been doing its duty in cars such as Swift and Ritz hatchback and Dzire sedan. The motor is good for making 84PS and 115Nm of torque. There is nothing special in the engine as it remains refined with the linear power delivery and the car feels just like driving a Swift when we talk about performance. The engine is offered with two transmission options, a 5-speed manual and a CVT automatic. It is good that Maruti didn’t go for the AMT gearbox as it would have ruined the driving experience of a premium car. The manual transmission as usual, is smooth and performs well as you would expect from a manual. However, the NVH levels could have been much better. The diesel one on the other hand, is again tried and tested in plethora of cars. The powertrain produces 75PS and 190Nm of max torque. This engine is a bit weak as compared to Honda Jazz’s i-DTEC which pumps out 100PS of power. Another drawback with this engine is the levels of noise it emits. However, the engine no doubt feels better than that of Swift, thanks to the lower weight. It does give usual turbo-lag at low rpms but offers nice punch on the go. At the same, it is a bit noisier than the petrol engine and the rattle filters into the cabin. The Baleno comes with ventilated discs at the front and drums at the rear, pretty much the standard affair in the class it falls. Further, the braking is enhanced by standard features such as anti-lock braking system and electronic brakeforce distribution. The car also features dual front airbags, dual horn, manual headlamp levelling, reverse parking assist sensors, driver and co-passenger seatbelt reminder, high speed warning and ISOFIX Child Seat Tether Anchorage as part of other standard fitment. The top variants also get auto dimming IRVM, pinch guard power window, reverse parking camera, rear wiper and washer, front fog lamps, rear defogger and automatic headlamps on/off functionality. What is the price of Maruti Baleno? On road prices of Maruti Baleno in New Delhi starts from ₹ 6.60 Lakh for base variant Sigma Diesel, while the top spec variant Alpha CVT costs at ₹ 8.77 Lakh. What are the colors options available in Maruti Baleno?